Hello everyone, I'm back with another video today. Today I'm featuring the new Rooting For You stamp set by Lawn Fawn along with using some Copic Markers along with Altenew Inks and Distress Inks to create a fun garden scene. 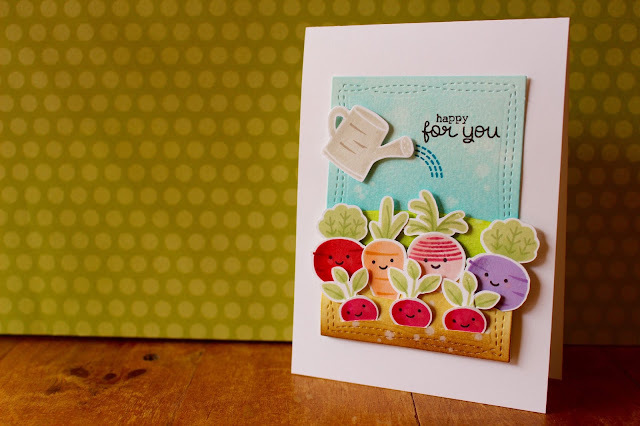 To begin my card I started off with all my image stamping. 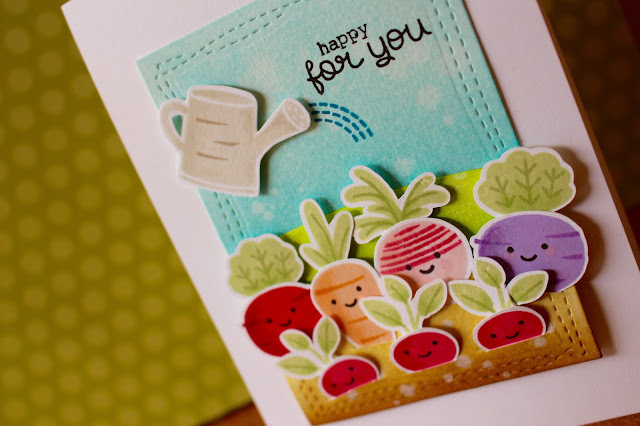 I used pretty much all the solid images within the Rooting For You stamp set along with my Altenew Crisp Inks - which are layering inks and they are amazing! Tip: to get a great stamped image with solid stamps, run an eraser over the top of them, clean off it excess and then stamp. Your images should stamp super well after that. Once I stamped out all of my images I used some Copic Markers in similar colours to the stamped images and added some shading to the sides of the vegetables to make them more dimensional. I then stamped out the eyes and cheeks from the stamp set also using more colours of Altenew Inks. I then ran all the images through my Brother Scan N Cut machine. I then die cut two backgrounds with the Wonky Stitches dies from Avery Elle out of some Canson Watercolour Cardstock and then used the A2 curved dies from Simon Says Stamp to cut down one of the pieces. I blended some Distress Inks over all the individual pieces to layer up on each other. I then sprinkled some water to create the popular water splotch look. I dried them off and arranged my scene. Once I was happy with how it looked I cut slits into the brown layer with a craft knife to stick my vegetables inside, it looks a lot more realistic this way! I then adhered all the pieces together, then adhered the watering can along with stamping the water down onto the panel as well. Once that was done I adhered my panel onto my cardbase and stamped down the sentiment which is from the same stamp set just using different pieces from it and that was the card complete.